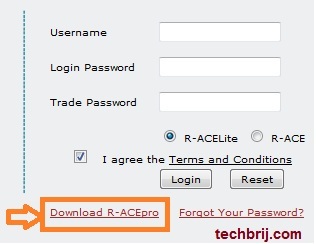 R-Ace-Pro is a trading terminal provided by Religare Securities Pvt. Ltd. for its clients for NSE/BSE transactions. It has Charting, Realtime feed, indicators and AMO­ features. 1. First you need to install Java Runtime Environment for windows to run Racepro. To Download JRE 1.5+, Click here. Note: If you are running windows 64 edition, Do NOT download “Windows x64” version of JRE because RacePro will not work with 64Bit JRE. I already faced this issue. 5. Now Open this page and click on “click here” option, It will open a pop-up page. Note: you must allow your browser to open pop-up. Click on “download racepro” option. 6. After downloading, install it as normal setup. im using my account through website and do my trading from website only . but their is a problem regarding java . whenever i entered my pass and other login id’s i usually see 10 written on the front page of share terminal usually where i see share fluctuation ? kindly help me and tell how to overcome from this situation …additionally i had removed and reinstall several times java but still situation remains the same .